You are here: Home / Seasonal Decor & Crafts / Make Stylish Farmhouse Christmas Ornaments with Only 2 Items! Here we go. Christmas is exactly 43 days away and I feel like the days are passing way to quick! I thought I was jumping the gun making these farmhouse Christmas ornaments, but it looks like I am right on track with everyone else these days. If you are looking for a simple, and beautiful Christmas ornament, keep reading to see what I am making! So, last year I was in charge of coming up with an easy Christmas craft that my daughters kindergarten class could do one day in school. This was a bit daunting for me. I could just imagine me walking into a classroom full of kindergartners, showing them what we would be making, and running for my life as they booed and yelled at me….well they didn’t! They thought it was tons of fun, and my daughter and I ended up making more at home! Homemade Christmas ornaments for kids? Not usually in my wheelhouse. But, I think I came up with a pretty fun one, and I wanted to put a twist on it to make it more of a stylish and grown up version, my fabric and stick Christmas tree ornaments are a hit for kids, but also fun enough for adults to make too! That’s right, these are made with fabric strips and a cinnamon stick or a piece of a stick from the yard. You can choose any fabric style you want, since these are the easiest customizable Christmas ornaments. You can choose any kind of fabric you wish, so that they will look perfect with your Christmas home decor. I decided I wanted to make them with one of my favorite kinds of fabric, cotton muslin. I tell you, this fabric is so versatile. I have used it for so many things, including some simple Christmas stockings, and many many other things. Cinnamon Sticks, or sticks from a tree cut down to about 5 inch lengths. I ended up using sticks from the yard last year since my cinnamon sticks didn’t show up in time for the project. …Think last minute, in the middle of a snow storm….my husband outside cutting down a few branches to cut them up. It was soooo cold. I felt kind of bad…..kind of. 1 yard of fabric, or multiple fabrics if you want them to have more than one color or style. You will cut your fabric into 1 inch thick strips and then cut them into about 8 inch lengths. You will be cutting them one they are all on the sticks. 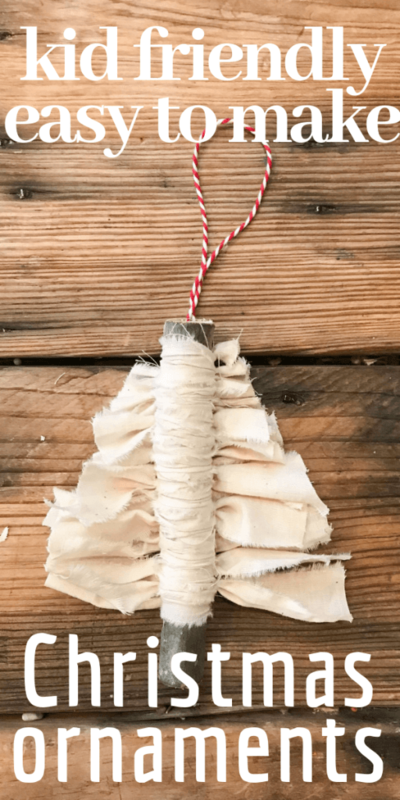 Its no secret that I like to reuse and re-purpose items from around my house and this easy Christmas ornament is a prime example of something you can use items from around the house and not have to spend a bunch of money. This is also incredibly easy to make with kids…and I would know since I made these with about 25 kindergarten kids that were so hyped up for Christmas I didn’t think I would make it out alive. But, alas I did! And I am so grateful for that! 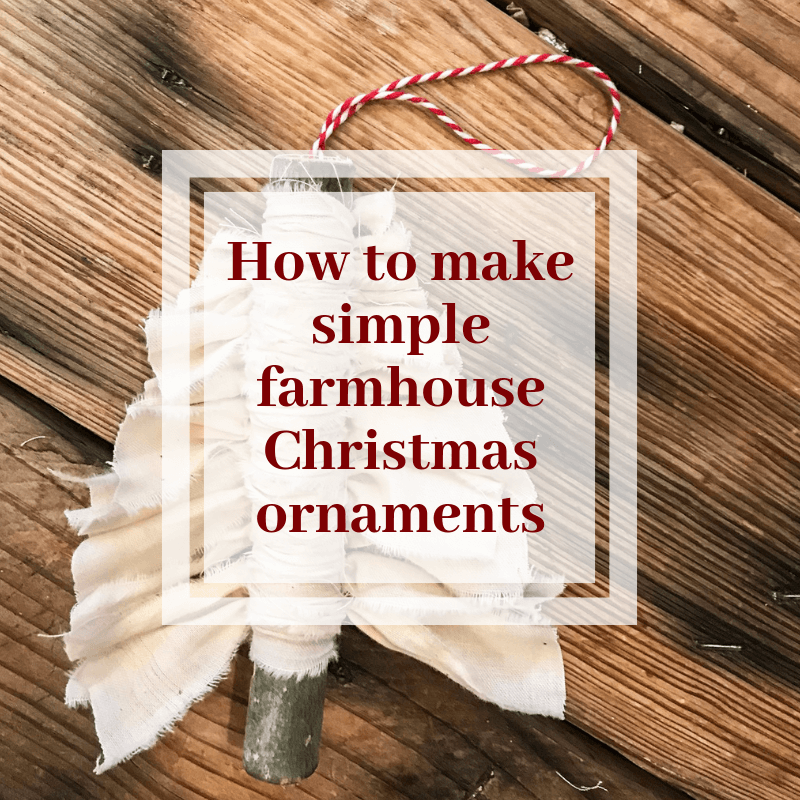 So, to make this super easy, I have created a video with exactly how I made these fun farmhouse Christmas ornaments for your convenience. I also wanted to write out some instructions just in case you’d rather read than watch. Then cut those strips into approximately 8 inch long pieces. begin tying the pieces of fabric onto the sticks, keeping them tight together, tying them all on the same side so one side has the ties and the other side is smooth. Tie as many pieces of fabric as needed until the stick is full from the top to the bottom with about a 1 inch space at the bottom which will be the trunk of the tree. Now, lay out your stick, smooth out and straighten the fabric pieces and cut them on an angle, making them shorter at the top and longer at the bottom like a Christmas tree. 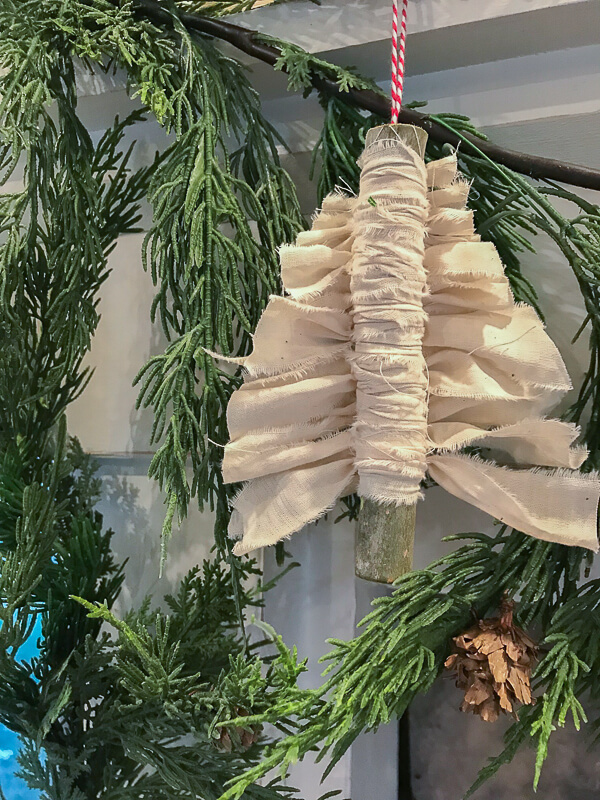 Last, take some twine, ribbon, or extra fabric and hot glue it to the top of the Christmas tree ornament with a loop so that you can hang it on the tree. You can add other items to your Christmas tree ornaments such as jewels, glitter, pearls, etc if you want to jazz them up. I made mine simple and white which works well with what I will be doing for my Christmas tree this year. I love how versatile this project is, and that you can customize this Christmas ornament in any way you want to make them fit your decor. The organic look of the twigs and fabric add softness to a Christmas tree and are so very pretty! I cannot wait to hang mine on my tree this year…since mine is not set up yet…we have to go cut ours down…or we get to! Whichever you think it is:) These will be the perfect Christmas decoration for my tree. I really love creating and I love to create decor for Christmas. There is something so nostalgic about decorating and doing Christmas crafts. Its especially good now that I can do some of these fun Christmas crafts with my kids. There are so many fun things you can do with your kids for Christmas. Why not make a few fun Christmas ornaments with them. Its something that you can carry with you for a long time. The memories you make are priceless. I know they are some of my most cherished times together. Make sure to save this for later and share it with your friends and family! Love this, Sara 🙂 Perhaps I could use the old Chrismas fabrics I have. Thanks for sharing this DIY Christmas ornament.